Gretchen’s deep desire is to see women transformed by power of the Holy Spirit, living with Gospel passion, an authentic beauty and a radiant grace. Gretchen is a passionate learner and teacher of God’s Word. It was through scripture she was inspired to teach other women and walk alongside them as the founder of Gretchen Stevenson Ministries. She understands the call on women’s lives for more, better, and different, and she also knows the balm to that try-hard existence is a life fully surrendered to Christ. Gretchen has studied and taught God’s Word formally as a student in seminary, and informally while mothering and raising a strong, Christ-centered family. 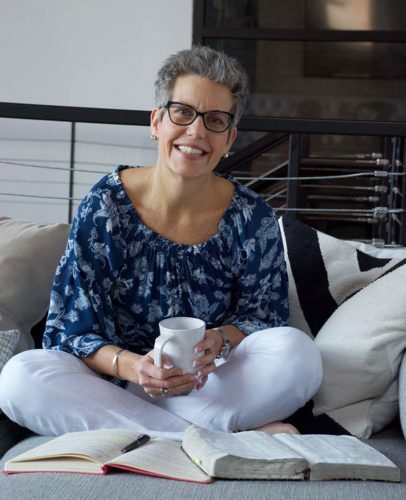 She continues to study and teach scripture through Gretchen Stevenson Ministries, and also while serving as the women’s pastor at Rockpoint Church in Lake Elmo, Minnesota. Gretchen loves to spend time with her family–– husband and high school sweetheart, Mark, and their three grown children. She finds time to travel and extend her love for others on international mission trips, most recently to Haiti to serve alongside a group of amazing women. While home, her favorite ways to recharge are while enjoying the outdoors via hiking, biking and kayaking, or relaxing with her family. I believe the Bible is the inspired Word of God and inerrant in the original manuscripts. I believe the Scriptures have been preserved by God and used to create a Bible that is the divinely authoritative standard for all creation. I believe that the Godhead exists eternally in three persons: Father, Son, and Holy Spirit and that these three are one God. I believe God is the absolute and sole creator of the universe and that creation was by divine command. I believe that God sent Christ into the world to save sinners out of His indescribable love for His children. I believe in the death and shed blood of the Lord Jesus Christ. I believe that by way of the cross He made perfect atonement for sin and redeemed all from the curse of the law by receiving that curse for us. All people are saved and justified by Christ and Christ alone. I believe salvation with the forgiveness of sins is entirely apart from good works, baptism, or church membership. Our only hope of new life in Christ is solely through God’s gift of grace, which He extends to all who believe in Him. I believe it should be every Christian’s desire to be a disciple of Jesus Christ by growing in spiritual maturity through the knowledge of Him, through obedience to the Word of God, and in submission to the Holy Spirit, who indwells and seals all those who come to faith in Christ. Gretchen’s deep desire is to see women transformed by power of the Holy Spirit, living with Gospel passion, an authentic beauty and a radiant grace. See if Gretchen is the right fit for you or your event.